Ralph Lauren Big Pony 3 for Men has a special power, filled with ingenuity. 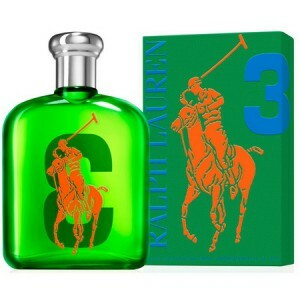 Ralph Lauren Big Pony 3 Green 125ml. Eau De Toilette is an aromatic fragrance, fresh and spicy men, known for persistence. Receives the admiration of all and enjoy the essence of every day. This distinctive fragrance has a special power, filled with ingenuity. Drift waves of this fragrance line complex. It is suitable for any occasion, both at work and in leisure. This fragrance will give always something new. It's like an elegant lady with such a beautiful couple you will shape and enchanting. It will create a strong bond between you that no one can break. Striking notes of the perfume Ralph Lauren The Big Pony 3 Green are the data of ginger, citrus and bergamot. Aroma is full of rich wood make it a perfect day, according to any occasion. It is designed for men who are confident in themselves and are guided by intuition. This fragrance is highly praised men who love strong essence of peppermint and ginger. Ralph Lauren The Big Pony 3 Green gives a sense of joy and good humor. You can wear both in hot summer months and in winter filled with snow flakes. Glass hiding refined fragrance evokes elegance, style and uniqueness. The perfume was launched in 2010 and has become a refreshing and delightful surprise for many men. In his collection of fragrances The Big Pony Collection by Ralph Lauren displayed the main male character traits, each of which is dedicated to a single flavor. During bottle green with the number 3 lies a passion for travel, adventure and just to walk in the fresh air, enjoying the breath of the wind. Top flavor notes are very mysterious, magical and mesmerizing shade. - Ginger root smells East, tales of Scheherazade. The aroma of ginger tones, gives vivacity and awakens interest in learning new countries and territories. Complements ginger breath minty coolness East - mild mint flavor, which relieve fatigue after a long journey and will wrap comfortably.